a relationship to the detriment of her partner. I find this crime thriller a surprisingly underrated, and underappreciated film. Solidly directed, and written, but most of all acted perfectly. Debra Winger and Theresa Russell are brilliant in this movie. Winger plays the part of Alexandra. Theresa Russell plays the part of Catherine. Catherine is psychotic. She preys on men, seducing them with her sexuality and femme fatale ways. Once she has her goal, she marries them, and then as you would guess, her being the Black Widow, poisons them. Through death after death, each one is overlooked. Enter Alexandra who is a member of the Justice Department, who just happens to stumble upon the first death, and then her research leads her down to the truth, and the real horrors that is happening. Alexandra must locate, and bring the truth to light, in hopes to stop the Black Widow preying on unsuspecting men. All one has to do is look at cast, besides the wonderful Winger, and Russell, there is the one of a kind performer, Dennis Hooper, I so miss his talent. The phenomenal, and greatly underrated actor Terry O’Quinn. The amazing and beautiful Diane Ladd, who needs no introduction. One of my personal favorites, Lois Smith. Smith if royalty in film. The spectacular James Hong, and many others, give dynamic performances. The shinning stars are the two female characters. Winger is brilliant like always in this part of Justice seeking crusader. The stealer of the film is Theresa Russell, who shines in total mystery, depravity and pure character. She and Winger own the parts, and makes you believe in their characters. Both give a performance that lingers long after the film is over. Directed by a director that stands out above and beyond Hollywood. The one and only Bob Rafelson. Rafelson has given the movie world some memorable films, both great and small. From 1970’s Five Easy Pieces, to 1981’s The Postman Always Rings Twice, to 1990’s Mountains of the Moon. He is a talented soul that is able to capture his actors, and actresses in thought provoking ways on screen. Black Widow is one of those films that he shinned in making. As I have stated, I have often felt this movie has been over looked. I think if one was to look at the film, and pick it apart, yes it has flaws, but I feel the solid direction and acting, and moody reality to the plot, seals the deal as being something to talk about. Its one major flaw is the movie gives away too much, too soon. The suspense is there, but most of it is taken away by giving the viewer so much, so soon. Many critics have mentioned that fact, but I think one can overlook that reality because of the solid performances, and the way the film is executed. One thing that has to be mentioned is the cinematography by Conrad L. Hall. What an experience seeing. Conrad truly had an eye for what he wanted to capture, and display on screen. Conrad had an amazing career of films under his belt. Cool Hand Luke, In Cold Blood, Butch Cassidy and the Sundance Kid, Marathon Man, American Beauty, Road to Perdition, and many others that he graced with his mastery. He was recently honored with another Twilight Time blu-ray release with his work in it, Fat City, which you can read my review for it here. Conrad is no longer with us, but his talent still shines in top quality blu-ray products like this Twilight Time Blu-ray. I have to give a huge mention to one of the actors in the film. Nicol Williamson. He was one of the finest actors in all of cinema history. He plays the part of William McCrory in Black Widow. No matter what I have seen him in, small or big, he gave his all. He was an actor both on stage, and in film and TV. His legacy will always be remembered. Many critics talk about his wonderment, and expertise in performing. He is no longer with us, but he left a wonderful career in films, both great and small. It was wonderful seeing him in this film again. I actually had forgotten that he was in this movie, so it was a treat to see him again. This screenplay was written by writer, and film producer Ronald Bass. Bass would win an Oscar for his Best Original Screenplay of the wonderful motion picture Rain Man. He also wrote screenplays for the wonderful 1993’s The Joy Luck Club. But I will always remember his book The Emerald Illusion which he adapted into a screenplay, which was made into the film, Code Name: Emerald. I feel this has been sadly overlooked by time, 1985’s Code Name: Emerald starred Ed Harris, and the master Max von Sydow. I hope one day this film will be honored with a special edition Blu-ray. 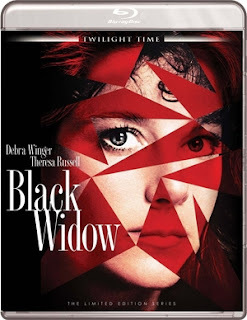 Black Widow the film in my view, is a must see film. It’s a crime thriller often overlooked and forgotten about by time. It’s somewhat of a stylistic film with the elements of an underlining true crime style that showcases in a sense, a reality based true crime documentary, or at least, places you there, during the investigation, and the act taking place. Again the film has never looked any better than this Blu-ray. Twilight Time crafts such excellent products. Vibrant in colors, crisp in imagery. Solid audio that sounds as if the film was made today. Twilight Time always amazes me with their technical side. They display their blu-ray products with such fine touches, that leaves you the buyer, and watcher thoroughly satisfied. Isolated Score Track. Another wonderful special feature. The music is done by a truly wonderful musician. Michael Small was a talented musical genius. He died too soon, 64 years was too short for this master. He has composed some of the great music in films, such as, 1971’s Klute, 1975’s The Stepfords Wives, 1975’s Knight Movies, 1976’s Marathon Man, 1977’s Audrey Rose, 1977’s The Driver, 1986 Brighton Beach Memoirs, and many others. His gift to films and music is something to remember, and something that stands out. Twilight Time honored this man with this special feature. Audio Commentary with Film Historians Julie Kirgo and Nick Redman. Two highly gifted film historians, and cinema gurus of pure filmmaking expertise. I love listening to these two. Julie and Nick are pure cinema gold, because you can tell they love film, and that’s very important to me. A great listen as always. In my viewpoint a must see film. Solid haunting direction, wonderful moody, and emotional acting. This product in my view, is a must own. Twilight Time did another great and worthy job to be praised and highly recommended.